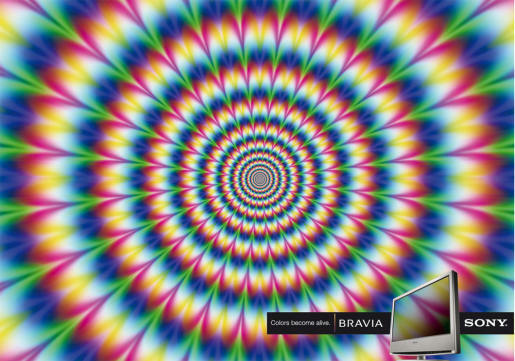 Colors become alive in this print advertisement for the Sony Bravia television from Argentina, an expression of the “Colours Like No Other” campaign perhaps. Try scrolling up and down for more effect. The Visual Effect advertisement was developed at EURO RSCG Buenos Aires, by creative director Gustavo Reyes, creative director/copywriter Mariano Duhalde, creative director/copywriter Tony Waissmann, creative director/art director Maximiliano Sánchez Correa, art directors Pablo Carrera and Guadalupe Covas, copywriter Alexis Alvarez, and account executives Luján Somoza and Nadia Faour.